KOCI-FM, 101.5, a local radio station that serves most of Costa Mesa and Newport Beach, is hosting a series of live radio broadcasts this week in the run-up to the elections next Tuesday. 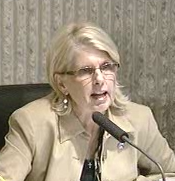 Today, Tuesday, October 30, 2012, at 6:00 p.m. for approximately one hour Troy Davis will host a discussion of Jim Righeimer's Charter, Measure V. Participants will include Costa Mesa Mayor Jim Righeimer (sperm donor of the Charter) joined by his appointee on the Planning Commission, Rob Dickson. They will face off against councilwoman Wendy Leece and former Planning Department executive and current community activist, Perry Valantine. You can listen to this program live on radio or live streaming audio on your computer at www.kociradio.com. This should be a lively affair and I find myself wondering how two calm, courteous individuals like Leece and Valantine will fare against the pugnacious Righeimer and the thoughtful, but misguided, Dickson. I guess we'll see. That question is easy, Geoff. Righeimer will talk over them, loudly, and lie constantly as he did at the debate, and Dickson will spew misinformation as he has a habit of doing and hope no one is smart enough to figure it out. I hope these two Leece and Valentine challenge Righeimers repeated lie how Costa Mesa needs to be like Newport and HB how they save money by not paying prevailing wage. It's a lie. Newport Beach and HB both follow state law on prevailing wage. Both websites say so. The ABC a group against prevailing wage criticizes Newport Beach and HB for not exempting themselves. Newport Beach on their RFPs has the statement any contractor has to pay prevailing wage. What is really sad is that 2 questioners at the Feet to the Fire Forum who follow Newport Beach failed to correct the lie by Righeimer I guess we shouldn't have expected Jack Wu to correct the lie anyways as he perpetuates lies. But why its especially sad is because just last month the issue of Newport Beach looking into exempting themselves was front page news in the Pilot and it was also carried in the OC Register. Below is the first few lines from the OC Register. NEWPORT BEACH – City officials are proposing to exempt construction companies that bid on city projects from a state requirement to pay prevailing wages, or basic union rates. The proposal, scheduled to be discussed by the City Council today, would save money for the city and the construction companies, according to a city staff report. 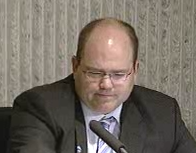 But City Manager Dave Kiff said Monday that he intends to ask that the item be postponed until Sept. 25 after the Building Trades Council of Los Angeles and Orange County requested more time to meet with staff about the matter. Here is from The ABC who are donors to Mensinger and McCarthy campaigns. From an updated 2012 study. Inspite of the truth you will most likely hear Jim Righeimer lie about this again tonight as he did at the Feet to the Fire Forum and as he often does. Prevailing Wage Policy The city requires compliance with the state’s prevailing wage law. Notes City of Newport Beach Request for Proposal RFP No. 5-12. Someone needs to correct Fitzpatrick's lies in comments to the Daily Pilot. I do not use Facebook, so I can't. In regards to prevailing wages, The City of Newport Beach voted to continue the discussion of the prevailing wage exemption to January 2013. Therefore, the prevailing wage clause still stands. In regards to landscape maintenance, the City of Newport Beach voted to combine two existing maintenance contracts into one contract with one contractor. 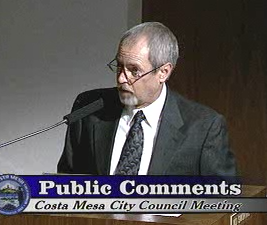 Costa Mesa already contracts several maintenance functions, such as mowing and tree maintenance, and were never precluded from doing so even as a General Law city. Because the idiots on the City Council did not want to follow the current contracts and laws on the books concerning privatization of services, they were sued. What is ironic is that if they would of just followed the MOU's and laws they could of accomplished their goals without the $2,000,000+ in legal fees. It amazes me that their are even people that support these idiots and their minions. What makes people think that fat, pompous jerks are the best to run a City? Absolutley amazing. If you keep repeating the lies, over and over, you and your followers will start to believe their own BS. Nice job by Leece and Valantine. Napoleon Righeimer and his lies were reasonably kept in check by the moderators. That Richard Simmons voice doesn't serve Napoleon well. You're expecting to "sweat with the oldies" any minute..